Picked up this little beauty at the thrift store for $5 dollars and gave it a little PolyShades love. 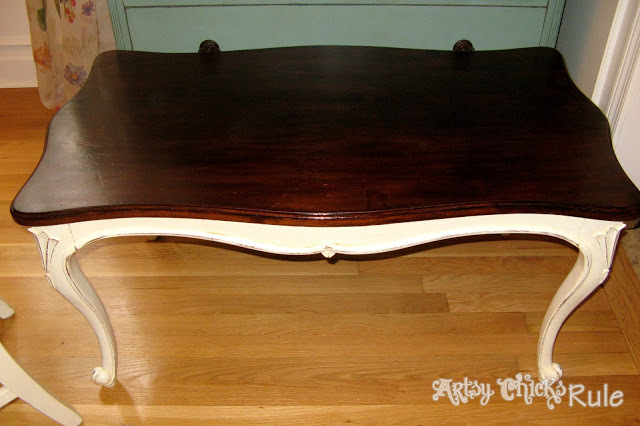 Well, here is what it looked like after a little Minwax Polyshades & Chalk Paint….. I used the two colors “Espresso” & “Antique Walnut” in the Minwax PolyShades. I’d say about 3/4 of the Walnut to 1/4 of the Espresso for some depth. I lightly sanded the top just enough to take the shine off. I put several coats over the top, letting them dry in between. I lightly sanded, with a very fine grit sandpaper, in between the final coat. It ended up a very lovely shade and with just the right amount of “age”. This worked perfectly because I didn’t want it to look brand new. I wanted it to look aged. I love the character of an old piece. And now this looks like one….in a good way! For the base I used Annie Sloan Chalk Paint in Old White. I distressed the edges a bit and then put a coat of polycrylic over it to seal the paint. And like new. Better than new really! Just a few simple products….and there you have it…..
What a difference a little paint and poly can make. Have you used Minwax PolyShades or Chalk Paint yet? Do you think this is something you would try? 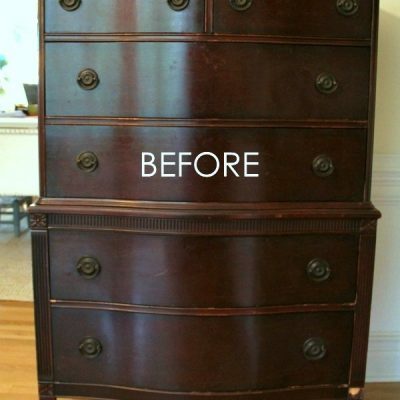 Want to see even more “before & after” furniture makeovers?? Click here. Be sure to check in next week to see what I did with this little cutie! UPDATE!! See it now, here!! Loving it! What a cool piece..and such a rocking deal!!! Great work lady!! Very nice transformation. Love the table. Love this! I just started following you on Instagram. Hey there!! Yes, I recognized you and followed you back! :) Thanks for the follow there!! How pretty! I love what you did with this piece – it looks fantastic!!! I just picked up a coffee table at a thrift store too ($7), now I know what I am going to do! Thanks!! Thank you Sandi! :) $7 dollars, awesome! Those are the best finds! Nancy, she turned out great. Now you really notice the legs on the table. Great buy! Yes, you really do! It’s amazing how much detail is lost and then found once painted & distressed. The table is beautiful. It looks quite expensive, now!! Thank you Amy! I agree. :) It’s amazing what a little paint and poly can do! Thanks for stopping by and the sweet comment! You go girl I just saw that you were featured again! Ha thanks!! I didn’t even know until I read your comment! I went searching. ;) Found it! Great looking table!! You did a great job! Awesome find! Looks great! 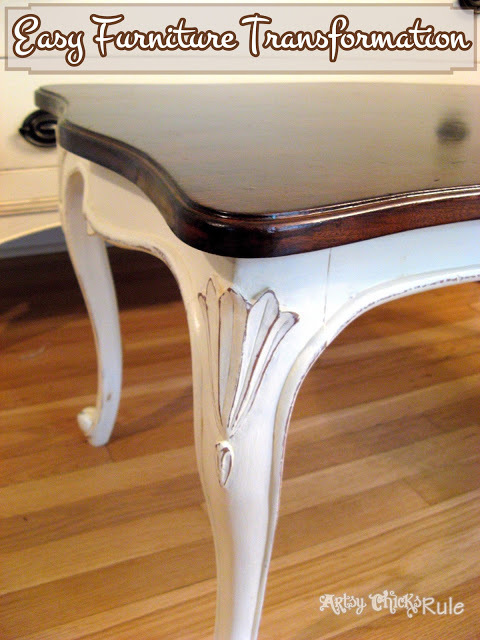 Love the contrast between the painted base and stained top! Thank you Jenna. :) Me too! I just love contrast. The table turned out beautiful! Love the mix of the two shades on top. Worked out pretty well I think! Beautiful job Nancy! I love the new look!! Wow! What a beautiful piece. You definitely saved it! Thanks Kim :) Yes I did! It was in sad shape!! The table looks absolutely gorgeous!! I love the contrast of the two stains. Perfect mix. Loved your about page. I’m your newest follower. I’m an east coast girl, too. Nancy, your coffee table looks awesome! Hi Martina! Thanks so much :) So glad to have you here!! 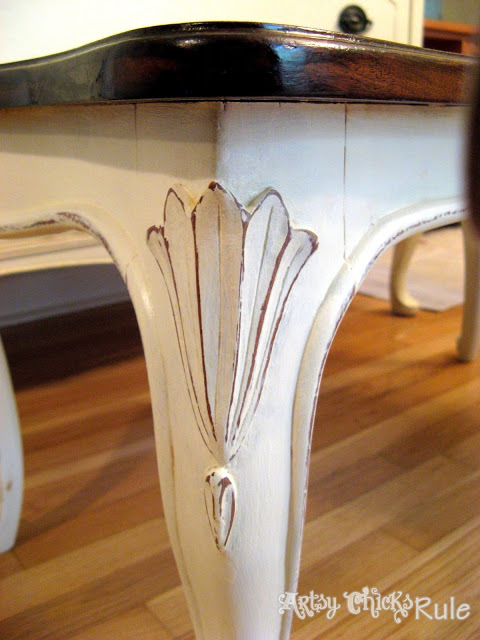 I love painting furniture…and everything really. ;) I would love to see what you do with your pine unit! Email me with photos when you finish it..really! I don’t think you are optimistic at all…you can do it! Hi, what kind of brush/roller did you use to apply the PolyShades? I typically don’t recommned waxing a table that will be used for dining, etc. You have to be super careful not to place hot items on it (wax) and yes, it can stain sometimes. I would finish it in a poly of some sort. 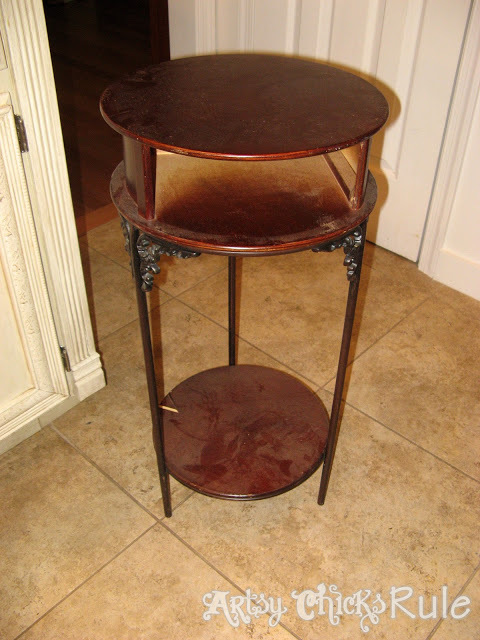 Hi Nancy, I am new to painting and refinishing old pieces of furniture usually small things like side tables and such. I love the work that you do and I have a question for you. When you apply the stain with a foam brush how do you avoid the stroke marks? Do you put a lot of the stain on at a time or just keep dipping the brush every time? I seem to have a hard time when I use a foam brush. Any advise you can share with me I would appreciate. Thank you for sharing your projects they really are beautiful. I am looking through you blog since I just started following you and I am in love with this. I have a table I want to paint but I have been afraid too. I think I will just jump in and do it! It’s only paint right! Did you have any discoloration on Old White when you used polyacrylic ? I have trouble using it over any light colors. Any hints? 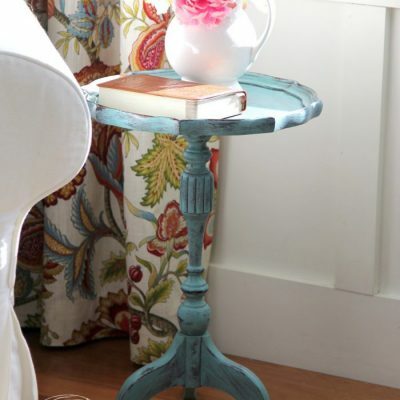 Love Annie Sloan chalk paint! Haven’t mixed it yet with a stain but must try after seeing your table. Thanks for sharing. Oh yes, I do love painted wood but mixing some wood with paint is a gorgeous look, in my opinion!! 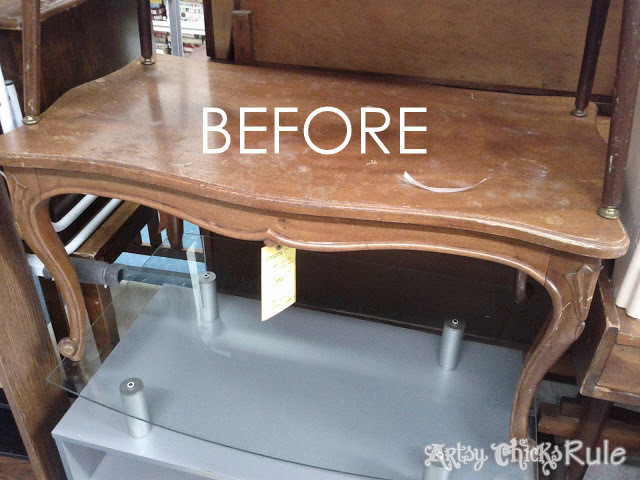 Have you ever come across a thrift store glass top table that was scratched? I found one that I absolutely loved but the scratches kept me from getting it. 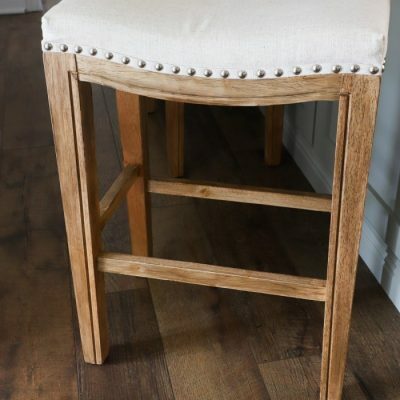 To replace the glass table top (dining room size) it would have cost around $500-$700 and I just couldn’t think of how to either disguise the scratches or make them disappear. Any suggestions? Gosh I don’t know! That is a crazy amount to have to spend on the glass. I think some options would be putting something different there. (unless you were set on keeping the glass) You could make a new wood top and stain to match (or even paint a color, white, black, etc) or inlay some tile, etc. Other than that, I don’t really know how to remove the scratches. Sorry! I thought this table looked familiar. I bought it from you at a consignment store in Yorktown. Just letting you know that I absolutely adore it. It’s my favorite piece of furniture. Tasha! OH, wow really?? That is so neat…and so very nice to hear. I have to tell you, this is one of my very most popular posts!! (and one of the most pinned on Pinterest!) People seem to just love this table. So glad you do and are enjoying it. :) Thank you for letting me know! I love, love, love this piece. My husband and I just getting into repurposing furniture and old wood pieces. I am always looking for ideas. I am with you on not wanting to paint the chairs!! My least favorite thing to paint. ;) Although I do love the look of them painted. I would do exactly as you mentioned and try that first. Leave the chairs the same as the table top. Then find a lighter seat cover to bring in some of the painted bottom of the table..to the chairs. See how you like that for a bit before you paint all the chairs. 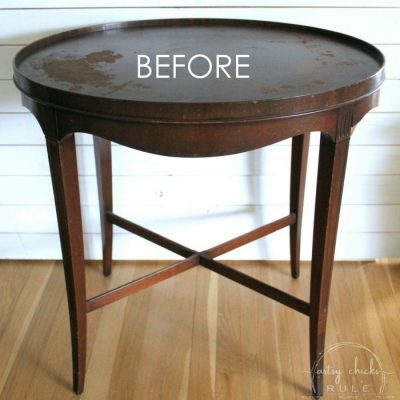 I just finish a smaller table the same way, did you use annies paste on top of the minwax top? or… do I have to get a minwax product to wax the top too? No I didn’t use AS Wax on the top. It is just finished with the PolyShades. The AS Chalk Paint and wax are on the bottom half only. You don’t have to wax over the Minwax PolyShades. Hi! Love this piece! Question…..I’m guessing that you mixed both colors together for the top of the table right? Or did you layer them? Great project…I love the results! When you say that you “distressed the edges a bit” what do you mean exactly? 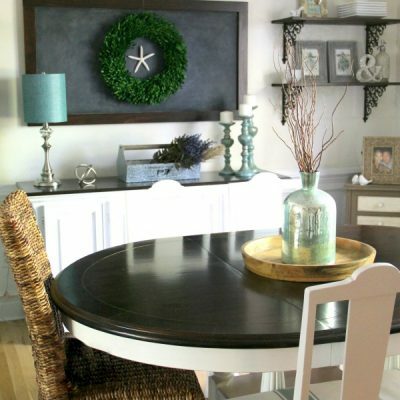 Did you do the white chalkboard first then come back a sand down to create highlight areas? Did you wipe off areas while still wet? Hiya Nancy! What a beautiful job on the table! I love the contrast in the colors. You inspired me to try the same combination on a dresser I have . 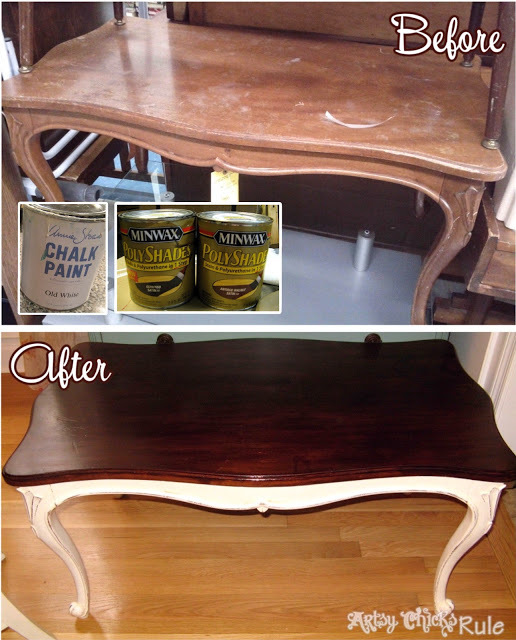 I recently used the polycrylic on a coffee table top over AS chalk paint. There are brush strokes visible… Is there a way to minimize the brush strokes with the paint and poly?? 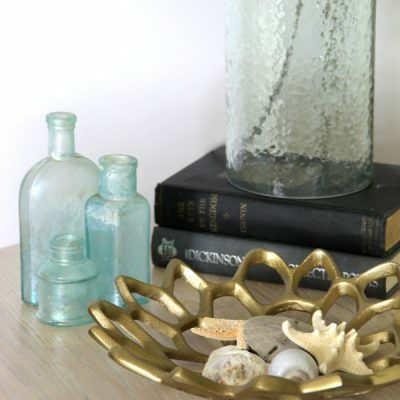 You can lightly sand after it is dry and apply another coat. A good brush and a light hand will give you less visible strokes. For the Chalk Paint, try lightly sanding and adding a bit of water to your final coat. If it is too thick it will be more likely to get brush strokes. I wouldn’t say it was necessarily more durable (athough the Varathane poly I used on my kitchen cabinets seems to be!). It’s mostly just a matter of preference. The wax is also pretty durable once cured but does need a bit of upkeep. I also love General Finishes High Performance Top Coat. Oh, I love this table!!! I hope i worded that correctly so it wouldnt be as confused as i am! ha! Was this table all wood or is the top veneer? I have a coffee table that I want to refinish like this but the top is veneer. Can is sand and stain it like wood? Your table looks great! Hi this is beautiful. I have a question. You didn’t have to strip the top? You just sanded? Hi Nancy, I came across your post just now and I must say I love what you did with the table! I know what I’m going to do with my table now. I see that Polyshade comes in satin stain and gloss stain, so could you please let me know which one you used? Also how did you manage to paint the legs? I did a trial on my table the other day and I found it hard to paint the legs where there are curves. I’m just not sure which directions to go (left to right, top to bottom, etc.) Thanks! Just did my kitchen cabinets and accessories in Country Grey Chalked. It had good coverage for not removing prior testers which I wish I would have for a smoother finish with a stripping gel. I love the new shelf liners that match and will be redoing the wallpaper(bad walls) in a white cherry blossom with silver drawing and refreshing the ceiling color. I’m considering doing Old Ochre chalked for the living room walls and am still debating a color if I want to take on the living room furniture such as coffee table, end table, entertainment stand. Wish I had some suggestions…am looking through pictures of what some have done to get ideas. Sounds lovely Laura! 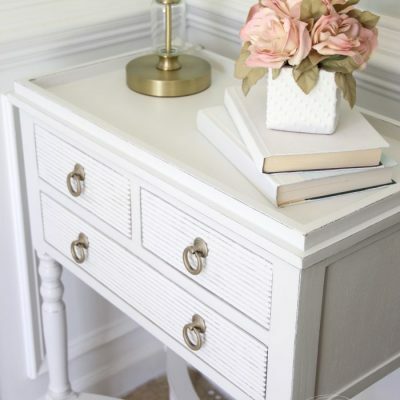 You can lightly sand the Chalk Paint to get a smoother finish. Or roll it instead of using a brush and also giving it a very, very light sanding. For the living room furniture, it all depends on your other colors and whether you want to go light or dark in there. You could use a complimentary lighter shade (such as even mixing the Old Ochre with some white to lighten it up a bit) or you could go in another direction entirely, like dark or medium blue, red, etc. All depends on your color likes/dislikes. :) Looking through photos is a great way to gather inspiration though! !